After surveying or interviewing over 450 people, it was apparent that many Roxboro residents are loyal and enthused about their hometown. They cited the new businesses, the variety architecture, the potential of underutilized buildings and small-town charm and friendliness as reasons to be hopeful. They also cited the same underutilized and blighted buildings as eyesores and decried the lack of family-oriented activity as part of their disappointment in the Uptown experience. The City of Roxboro and the Uptown district is a community of about 8500 people located approximately 30 minutes north of Durham. Time has not been kind to Roxboro, as manufacturing and related jobs left the area. It’s difficult to find full time work in Roxboro. As a result, many businesses that depend on local shoppers have struggled and/or closed. But Uptown Roxboro does have tremendous potential. And many unique businesses with resolute entrepreneurs at the helm. With well-coordinated, sustained effort and knowledge of downtown development, they can make a change for the better. The Challenge: Roxboro is the only municipality in Person County. Only one highway runs through the county on a path to Virginia. Uptown Roxboro is located off the highway and is not visible to drivers on a north/south commute. The county courthouse and police station are located in Uptown. As the shops in Uptown closed, many spaces were filled with county government services and attorneys’ offices. While those offices and services do bring people to Uptown, they do not provide the mixed use required for small town economic sustainability. Other once-beautiful buildings that present a wide range of architectural styles have emptied and become blighted. As manufacturing and related jobs left the city, per capita income has dropped significantly. Remaining Uptown businesses struggle to find and keep customers. Point of Distinction: Uptown Roxboro enjoys a quiet but valuable point of distinction. They have several bold entrepreneurs who have invested their hearts and money in businesses that have a connection to the arts. The broadest definition of art, “the expression or application of human creative skill and imagination…producing works to be appreciated primarily for their beauty or emotional power,” is used to develop the Uptown brand. It allows the farm-to-fork restaurant, brewery, hair salons, theater, galleries, interior design, jewelry, thrift and clothing stores, artisan-made beauty products and beautiful, second-story apartments and new rehabilitation projects to fit within the brand. “Developing the art in living” describes Uptown Roxboro to a T. These assets are not typical in a town of 8,500 people that have struggled to survive the economic realities of the twenty-first century. This collective, artistic and optimistic effort is a point of distinction! Articulating the Brand: Uptown Roxboro is an urban-feeling, family-friendly neighborhood, nestled in the heart of a quiet little town in a beautiful rural setting. Uptown offers opportunity for those who appreciate and/or create a wide variety of art, and those who want to celebrate, relax and create memories with friends and family. Visual Identity: The visual concept for Uptown Roxboro is vibrant but conservative. It is composed of two parts: the strong type treatment of Uptown Roxboro and the companion graphic of a streetscape grounded by a paintbrush. The brick color in the type treatment of Uptown is a visual link to the many beautiful brick buildings in the Uptown area. The navy-blue platform of the word Roxboro is solid and conservative. The letters are strong and project a positive, pragmatic, unvarnished feeling. The buildings in the graphic, with their subdued but atypically vibrant palette, lend a friendly urban feel and pay homage to the historic nature of Uptown. They emphasize the delightful variety of architecture in the heart of Uptown—a true asset. The brush-like swash connecting the paintbrush to the buildings adds several elements: the link between the buildings, brush and tagline, positive movement, and a sky background that creates depth in the graphic. The type used in the tagline appears to be rendered by a paint brush and further connects the concept, “Developing the art in living,” to the street scene above it. It is strong, but creative and fun. This tagline is authentic and aspirational—Uptown Roxboro is a work in progress where people do understand the art in living. The Process: Following our proven process, the project was broken into five phases. 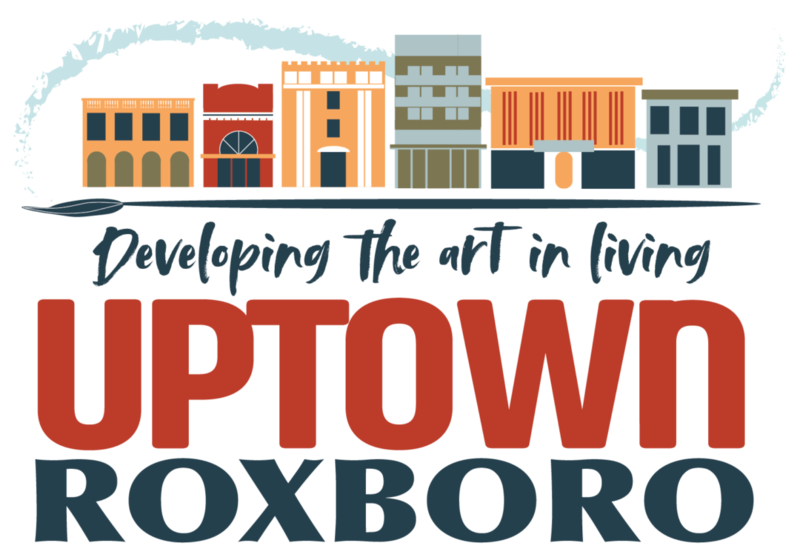 Uptown Roxboro Group immediately began to build Uptown brand awareness by changing their organizational name (from Roxboro Development Group), replacing the outdated website and rebranding social media platforms. The visual identity for their Cruise-In event was redesigned to support the new brand. The action plan continues with ideas for involving many local partners to create new activities in the Uptown area that will increase interest and foot traffic among residents. Eventual changes to gateways, wayfinding, banners and billboards and signage on the highway will continue to support the brand and build awareness among travelers going up and down the highway.